We begin near Cleveland, the state’s largest metropolitan area. I-90 comes in from the east along the shore of Lake Erie. At “Dead Man’s Curve”, the highway makes an abrupt and rather angular turn to the south to become the Innerbelt Freeway along the edge of downtown. The above view shows old and new aspects of the city’s skyline. The Terminal Tower is the classic deco skyscraper from the early 20th century is visible in the distance. The highly geometric and sleek Rock and Roll Hall of Fame is a contrast along the waterfront. In between, the Key Tower, the tallest in Ohio, combines elements of both. The bridge crossings over the Cuyahoga in Cleveland are numerous, and perhaps define the city as much as the skyline, if not more. Even the image above showing the Innerbelt Bridge carrying I-90, we see several others. There is a low-lying rail bridge crossing underneath at an angle. It is one of many low bridges that can be raised for water traffic on the river. I believe this one is no longer in use and is permanently in the raised position. The most iconic of the many crossings is the Detroit-Superior Bridge carrying US 6 and US 20 across the river into downtown. The name seems a little odd, as we’re not in Detroit and Cleveland is on Lake Erie rather than Lake Superior. But it connects Detroit Avenue with West Superior Avenue and thus the name is quite appropriate. It rises high above the river and is quite picturesque against the downtown skyline. Looking towards the lake from this bridge, one sees how closely packed the crossings are, and the diversity of shape, height, function, and level of disuse. In the picture below, we see the blue bridge carrying a major freeway, State Highway 2, beyond that a rail bridge, and in the front the ruins of the older Detroit Avenue viaduct. The viaduct, like the unused rail bridge shown above, are quite interesting as artistic subjects, and even qualify as “hyperart” as described in conceptual artist Akasegawa Genpei in his book Hyperart: Thomasson (you can find out more about it here). Thus, it should not be surprising that I would very much like to visit this part of the city for artistic inspiration, to explore the bridges both in use and abandoned, as well as other places along in this industrial riverfront section of the city known as the Flats. Cleveland has actually long served as a magnet for artists interested in urban and industrial landscape, so this is nothing new. Indeed, the city has seen the same cycle of others where rundown or neglected neighborhoods attract artists in search of low rent and inspiration, and then the costs of living rise. But it still seems to have much to offer and I hope to get the chance to visit soon. We depart Cleveland continuing on I-90, and then switch onto I-71 to journey diagonally across the length and breadth of the state. It winds through the suburbs, crossing many other highways before intersecting our friend I-80, which runs across the state as the Ohio Turnpike. The Ohio Turnpike is familiar from numerous cross-country trips, with the rolling hills and suburbs giving way to a much straighter road over flat terrain and farmland as one heads west. But in this instance, we continue south on I-71 towards Columbus, the state’s capital and largest city. 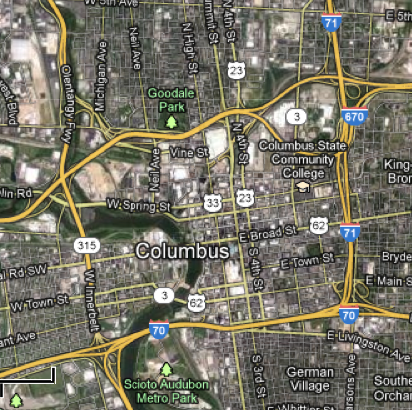 Columbus is in the middle of the state, and without much to get in the way it has developed the “standard” set of ring roads we see in many cities around the world: an outer beltway (in this case, I-270) and an inner belt around the downtown (a combination of I-70, I-71, I-670 and State Highway 315). Looking at the Ohio State House, it initially looks like something is missing: the dome that is ubiquitous on so many seats of government. It appears as if it has been shaved off. In actuality, this is part of the design, an older Greek Revival design that predates the current Capitol dome in Washington, DC, that was then used subsequently in most states. Columbus does have its bridges as well, including the Lane Avenue Bridge which includes some classical elements in its otherwise modern design. And of course I would be remiss if I did not mention Ohio State, as I have several friends who are devoted lifelong fans due to their connections to either the university of the community. Leaving Columbus, we continue southwest on I-71 to Cincinnati. One stop we must make while in the city is to the Contemporary Arts Center. The CAC is perhaps most famous for its exhibition of photographs by Robert Mapplethorpe in 1990 that still resonates in discussions of “controversial art” (though honestly Mapplethorpe’s photographs themselves don’t seem that controversial anymore, I have seen on multiple occasions in recent years). But the museum is more recently known for its building with fragmented geometric sections designed by architect Zaha Hadid; and for programs that feature architecture and design. The city is home to the Cincinnati Art Museum. It is a relatively conventional art museum with a wide-ranging collection, but it does include yet another piece by Mark di Suvero for us to encounter is this series. Atman is another large red metal outdoor sculpture, but without the typical rounded element. Cincinnati lies along the state’s namesake river, which forms the border with Kentucky to the south. As such the city has its own set of bridges, though nothing to approach the density of Cleveland. The most interesting perhaps is the John A Roebling Bridge. One can see many of the elements that Roebling would ultimately use in New York for the Brooklyn Bridge. Another Cincinnati Bridge that has been in the news is the Brent Spence Bridge, which carries I-71 together with I-75 south into Kentucky. The bridge is featured prominently in the city skyline image above. It also one of the 15 bridges labeled by the Federal government as “structurally unsafe”, which sounds quite bad (indeed, President Obama used it as a backdrop for a speech about rebuilding our infrastructure). The bridge itself made the case in 2011 when chunks of concrete fell from the upper deck to the lower deck. Proposals are currently being considered for a replacement.